Fired steatite button seal with four concentric circle designs from the Trench 54 area found at Harappa in 2000 (H2000-4432/2174-3). "In January 1927, Mackay began working in L-Area, ca. 28 meters south of the Stupa on the Mound of the Great Bath. He uncovered the so-called 'Assembly Hall' and other architectural remains that are not well understood, even today. He also found three pieces of limestone sculpture: a seated torso (L-950), a reasonably well-preserved bust (L-898) and a very poor, abraded head, possibly of a woman (L-127)." Asko Parpola writes: "Akinori Uesugi has shown that the spread of the Kot Diji culture all over the Indus Valley is connected with the spread of a new type of stamp seal, which continues to exist in the following Harappan period. The basic figure in these Kot Diji seals consists of “concentric circles,” usually four of them placed into the four corners of a square or cross-shaped seal." 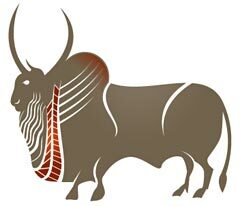 Mohenjo-daro!, a 103 slide series by Jonathan Mark Kenoyer, was first put up on Harappa.com in 2005. It offers a comprehensive walk around the current site, with key areas and discoveries, as well as an illustrated 6 page essay on the site. "'Every village has its own special guardian mother, called Mata or Amba' - some 140 different 'mothers' in all. 'Generally there is also a male deity, who protects like the female from all adverse and demoniacal influences. But the mother is the favorite object of adoration' (Monier-Williams 1885:222). The same held true in India at large, not least in the Dravidian-speaking south India." Touching Mounds at Harappa, one of the oldest inhabited places on earth, and one of those real world images that makes you think about the relationship between past and present. A workman handing over the Priest King at the time of excavations in I, Block 2 of DK-B Area during the John Marshal led 1925-26 excavations at Mohenjo-daro. Possehl writes "many classic Harappan style artifacts came to light at this time, including the so-called Priest King which emerged from Dikshit's excavations in DK-B Area, in a building that the excavators thought may have been a hammam or hot bath." The first sesame seeds were actually found at Harappa. About.com's Archaeology Guide K. Kris Hearst discusses the importance of sesame to cooking. "The Lothal craftsmen exhibited originality of thinking and great resourcefulness. 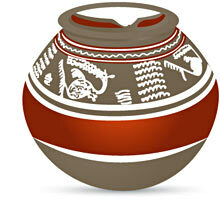 As an example we may mention the new style of earthenware with animal motifs which are more realistic than those on the Indus valley pottery," writes excavator S.R. Rao. "The main purpose of undertaking excavation at Lothal was to decide whether it could be considered as a true Harappan settlement where the people observed the same urban discipline and enjoyed the same material prosperity as in the metropolitan centres of Harappa and Mohenjo-daro." In 1996, we unveiled this 90 slide tour by Jonathan Mark Kenoyer. It has since been viewed by millions of people. Many have been kids in schools around the world. 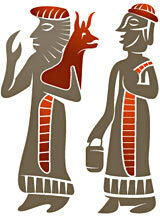 For the new version of Harappa.com, a new interface has been added, as well as taxonomies and links to related items. Poll: The first tools in the Indus Valley? We start 2016 and inaugurate the new Harappa.com by publishing long-lost images from Sir Mortimer Wheeler's personal collection. They are of the excavations he led at Mohenjo-daro in 1950. Happy New Year 2016, from a relaunched Harappa.com, starting our 21st year and the year of the expected release of Ashutosh Gowariker's Mohenjo Daro, an epic romance with some of India's biggest stars than could do more for consciousness of the ancient Indus Civilization than so many new discoveries.